There are a number of convicts contained within these family trees. Many of them had amazing lives. Research continues for many of them. These people, often the victims of abject poverty and an extraordinarily harsh legal system in the UK and Ireland, made an extraordinary journey to end up in Australia where they built new lives, and created new families. It is estimated that around 20-22% of the Australian population is descended from our convict pioneers. Craig’s direct ancestry includes two convict couples. This is a brief introduction to these Australian pioneers. Click on their names to read more. You can read about other convicts not in Craig’s direct ancestry here: Other Convicts. “JOHN ANSTISS was indicted for stealing, on the 20th of December, 1 plane, value 2s.6d., the goods of Benjamin Jenery. BENJAMIN JENERY. I am a carpenter, and live in Britannia-row, Islington. On the 20th of December I left my work at Mr. Young’s shop to go to dinner; the prisoner came in there, but did not say on what business – when I returned from dinner I missed my plane, which had been on the floor; I found where the prisoner lived, and had him taken up. THOMAS OLDFIELD. I took the prisoner, and found this plane – he did not tell me anything about it. 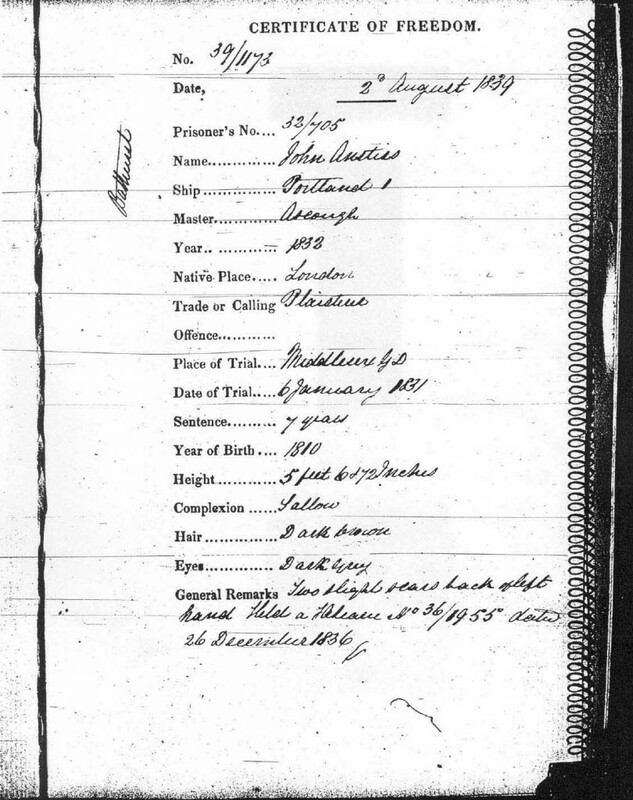 John arrived in Sydney as a convict aboard the Portland on the 26th March 1832. The ship had sailed from Portsmouth on 27th November 1831, a journey of 120 days. The ship carried 178 male convicts who were all disembarked in Sydney. John was assigned to work as a servant for Major Benjamin Sullivan, a landowner who had a property, “Thalaba”, at Williams River in the Hunter Valley. He owned this property until 1832. John was a brickmaker by trade but could also plough. John received his Ticket of Leave in 1836. His Trade or calling was listed as “Plasterer” and he was allowed to remain in the District of Bathurst. Having a Ticket of Leave meant that a former Convict could employ himself for his own benefit and acquire property, provided he notified the clerk of the local Bench of Magistrates within seven days of any change of address. However, he could not travel any more than ten miles from his residence without a pass, and he had to attend Worship weekly. John became a free man on the 2nd August 1839. According to his Certificate of Freedom (see below), he was 5 feet, 6 & 1/2 inches tall, sallow complexion, with dark brown hair and dark grey eyes. He had two slight scars on his back left hand. He married Catherine Leahy or Lahy (see below) in 1852 in Bathurst, but they had 6 children between 1837 and 1849. After Catherine’s death in 1857, he married Bridget Cushion (or Cushen) in 1858 in Bathurst. They had 3 children together from 1859 to 1864. Sometime, probably after 1884, he moved to Sydney where he died in 1900, in Balmain. John Anstiss’ Certificate of Freedom. Source: NSW State Records. View John T. Anstiss in Craig’s Family Tree. Catherine was tried in Waterford City, Ireland in July 1832 and convicted of Receiving. She was sentenced to Transportation for 7 Years. She arrived in Sydney as a Convict aboard the Surrey on the 9th March 1833, after a journey of 124 days, having departed Cork on the 5th November, 1832. One of the initial 142 convict passengers had died on the way as only 141 disembarked in Sydney. In the records her surname is spelled LAHY. She could not read or write, she was 20 years of age and her religion was Roman Catholic. Comments in the “Remarks” section refer to “First Cousin Robert LAHY about 2 years ago”. Her cousin Robert LAHY arrived as a convict on the Norfolk in 1832, having been sentenced to 7 Years for Aggravated Assault at the age of just 17. Having received his Certificate of Freedom in 1839 Robert squandered his opportunity after being convicted of Bushranging in 1839 and re-sentenced to “Life”. He was transported to the notorious Norfolk Island penal colony, and then to Van Diemens Land (now Tasmania) in 1845. He was still a prisoner there until 1851 having spent at least half of his life as a convict in some of the toughest penal settlements in Australia. Upon receiving his Conditional Pardon Robert left Tasmania for New Zealand. What became of him after that is presently unknown. Catherine received her Ticket of Leave in 1837. She was allowed to remain in the District of Bathurst. She received her Certificate of Freedom on the 10th September 1839 in Bathurst. Her Trade or Calling was listed as Housemaid. Her year of birth was listed as 1813. She was described as 5 feet 1 inch tall, fair & freckled complexion with brown hair and brown eyes. She was described as “sickly looking”. Catherine Leahy’s Certificate of Freedom. Source: State Records NSW. Catherine married John Anstiss in 1852 but they had 6 children between 1837 and 1849. Catherine died in Bathurst in 1857 from “Dysentry and debility of constitution from Intemperance”. View Catherine Lahy in Craig’s Family Tree. View Robert Lahy in Craig’s Family Tree. Charles was found guilty in the Old Bailey of stealing a coat on the 15th September, 1819 and sentenced to Transportation for 7 Years. He was just 18 years old. He arrived in Sydney on the Coromandel on the 4th April, 1820 a journey of 154 days after leaving Spithead on 1st November, 1819. There were 300 male convicts on board, 150 of whom disembarked in Sydney, and 150 in Hobart. “CHARLES FELL was indicted for stealing, on the 16th September, one coat, value 1 l., the property of John Eyres. JOHN EYRES. I am servant to Mr. Bolland, who lives in Southstreet, Grosvenor-square. I was going through Ball’s-pond gate, with a chaise and pair, towards Enfield – the coat was tied on the front of the chaise. The prisoner and another followed me about half a mile – I kept my eye on them. I took my eye off for a moment, and then saw the prisoner run off with the coat. I rode after him, lost sight of him for a moment, and he threw it away. JOHN TRAVERS. I am a gardener. I saw the prosecutor riding very fast after the prisoner. I followed, secured him, and picked the coat up in the way he ran – it was thrown over the hedge. Prisoner’s Defence. I never touched it. Charles received his Certificate of Freedom on 21st September 1826 and he married Julia Murphy in 1828. Julia was also a convict having come out on the Mariner in 1824 with a 7 Year sentence. She had been tried in Dublin City but her crime is presently unknown. They had no children, and he subsequently married Mary Smith, another convict, (see below) in 1831. Presumably Julia had died bu this time but no record has been found of this so far. He worked variously as a brickmaker in Windsor and a sawyer or timbercutter in the Illawarra region of NSW. Charles and Mary had only one son, Thomas, who appears to have adopted the name Thomas Stanley Herbert as a young man. This may have been a way of hiding his convict heritage. There is a question mark over whether Charles was actually the father of Thomas. I have not yet been able to find a record of Charles’ death. Visit Charles Fell in Craig’s family tree. Mary Smith was tried in Southwark on the 26th April 1830, found guilty of being a pick-pocket and transported for “Life” to Australia in 1831. She was just 18 years old. Mary came to Australia aboard the Kains arriving 11 March 1831 after departing London on 8 July 1830, a journey of 246 days. 120 female convicts embarked on the journey, and 118 disembarked in Sydney, 2 presumably died on the way. On her shipping record she is recorded as 18 years old, Catholic and Single. Her “Native Place” was Surrey, “Trade or Calling” was “All Work” and her offence recorded as “Picks Pockets”. According to her Transportation Record she was 5′ 1&1/4″ tall, with ruddy complexion and freckles, light brown hair and grey eyes. It was noted that she had some distinguishing features: “AWNH and other indistinct marks on upper part right arm BHPH on lower part left. JC bottom right thumb and forefinger long [indistiguishable text]”. She was “disposed of” to J Gaggin. John Gaggin had a 2000-acre grant at Luskintyre, between Singleton and Maitland. From 1827 to 1832 he was also superintendent of the Hawkesbury Benevolent Society’s herd of cattle at Mooki on the Liverpool Plains west of the Hunter. Mary married Charles Fell (see above) in 1831 and received a conditional pardon on 30th January 1847. She died in Bathurst in 1855. Charles Fell and Mary Smith’s Marriage record, 12 October 1831. They were married “with the Consent of the Governor”. Visit Mary Smith in Craig’s Family Tree.